Welcome to Citron & Rose Tavern. We are a community restaurant and bar serving the residents of Greater Philadelphia and Main Line suburban. We are Glatt Kosher, under the supervision of the Orthodox Union (OU). The restaurant is a re-opening and re-imagining of Citron & Rose, the restaurant launched in 2012 by Philadelphia philanthropist David Magerman. The new incarnation of C&R features a Mediterranean menu with traditional small plates, grilled and braised meats, and a delicious non-dairy dessert menu. We also have a large bar stocked with local beers on tap, specialty cocktails, and a selection of wine and liquor. Took a while for the waiters to take our order! We ordered two burgers medium rare, one came rare but very delicious. for the money, I thought it could have been a little better! The food was for the most part delicious. The short ribs were so soft and succulent and just plain delicious. 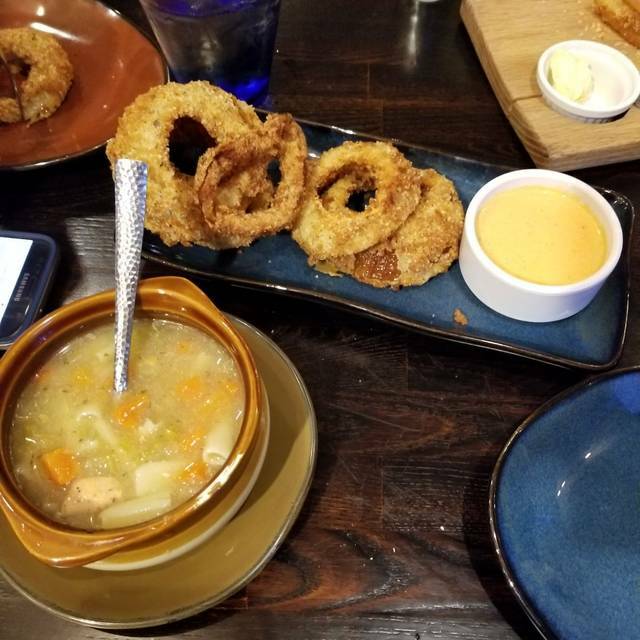 There were some interesting choices made with the appetizers in regard to the flavors and accoutrements they came with, but overall pretty good. Amazing ambiance. Just a lovely room. The service was great as well and the restaurant management checked in with us to make sure that we enjoyed our meal which is always a nice touch. Definitely plan to visit again next time we’re in Philadelphia. Food was very good. Enjoyed the hummus, roasted peppers, baba ganoush and pita. Spaetzle was also good. Fish tacos were better. Service was off but hope it is better the next time we go. The service was awful, the food - just ok, the waiters didn't know what was going on and the kitchen had probably just one cook while the restaurant was packed. In all, a very negative experience. Will not go back. This is an excellent, reasonably priced dining option in Bala Cynwyd. The fact that it is also glat kosher is an extra. Worth going to even if you do not observe kosher dining requirements (I don't). Once again, C&R did not disappoint. Thank you for being here. Loved our meals! Staff all very friendly and pleasant. Cannot wait to go back to enjoy other dishes! Duck and steak were delicious. The restaurant is beautifully appointed and the menu very interesting. We enjoyed our meal; the charcuterie platter was to die for and my husband's chicken entree was amazing. However, I chose a chicken sandwich and was very disappointed. It was supposed to come on house made sourdough bread, but it was just a normal hamburger roll. It came with cranberry relish and avocado, which I thought were sparse; I really should have asked for more. Neither the sandwich nor the fries were hot, so it was overall a big disappointment. Should have chosen a normal entree! Still, I believe we will go back. Just no sandwiches! Great food! Great service. For the price I would have wanted more per item. Felt like I paid a bit to much for the quantity.. Again the food was awesome! Dined with a friend sort of last minute. Comfortable fun seating in the bar area. Matt, the bar-keep was very sociable, attentive and a good sport to our cajoling. Everything ordered was as it should be and timely served. As always, Citron & Rose did not disappoint. The menu had recently been changed it’s new, savory and interesting dishes. We had the Salmon and tasty sides, along with a house wine served during happy hour discount period. When we arrived the restaurant was relatively quiet, though not for lack of customers. My wife and I had the treat of an empty house for a couple of days and we took advantage of the date opportunity with dinner at C & R. We will definitely be back and look forward to trying their new biweekly Tuesday night menus. Great restaurant. From the ambience, to the food, to the service, overall great great place. Also loved the decor and style. Our first visit to this restaurant Looks unassuming from the outside, but really nice ambience and very attentive service. We made it in time for happy hour. Small plates were big enough to share amongst the 4 of us and all were delicious. House wine for &5 was a great deal. Best entrees were the short ribs and sous vide duck. Would definitely eat there again. We had wonderful meal and a great time! Service was excellent. Excellent service. Our waiter made really great drinks and the food was delicious. We got a cauliflower appetizer with curry. It was really yummy. Then they had these churro bites for desert which was so delicious. It took a long time once we sat to get menus and then a long time to order food and drinks. Took a while to get 3 of the 4 drinks that were ordered. Had to go back for the forgotten 4th drink. Items on the menu were no longer available (lamb chops). Descriptions of how food was prepared was not correct (duck). Then the shared appetizer came out at the same time as the salads and we weren't done with this and our main course came out. Was charged extra for 2 more pieces of pita - only 2 were given with the appetizer for 4 people. Glass of house wine was $18. Food was okay but not worth the cost. Those who had ordered the duck had an excessive amount of fat that had to be trimmed off. Would not return. Unfair to judge based on this visit - the fire alarm went off & after the fire dept left they could only serve cold foods! A terrible limitation. Also there was (understandably) a bit of fall out & confusion as a result of the alarm. So - that said - despite the extremely slow service & bland food we did all agree to return one more time to see what the food & service was like without the fire brigade. By the way - this is a Kosher restaurant - and maybe there needs to be a box to check above. We had a very enjoyable meal. Food was excellent. Always out of something on the menu that is listed under dinner? First you would never know that this was a kosher restaurant. The restaurant beautiful decorated and the food was outstanding. Im in the food business and I have to say that this was one of the best steaks that I have ever had. Keep of the good work CR staff. So disappointing. My sister-in-law's short ribs were a fatty mess. My steak was terribly seasoned, highly salted, and overcooked. My wife's hamburger was over cooked, too. To add insult to injury, I was charged $2 for an extra dab of aioli sauce. Will never go back. Cand R tavern has greatly improved. Having said that the portions are still small for the price and we were here twice in one week (We only eat out kosher) and the first time my husband ordered his steak rare and it was fairly well done. My hubby is not the complaining type and didn't feel like waiting another hour for his meal so we let it go. Service is improving. After many years we finally tried it with friends who keep kosher. The place was great! Excellent food, atmosphere and service. We would go back even without kosher friends. This does not seem like a place for couples. Our table for two was in the middle of the aisle, so our chairs or table got bumped every time anybody walked by in either direction. There were several large groups and families there on Sunday night, and it was so loud that it was hard to hear across the table. The food was fine, but we will not be returning because of the ambiance. Eight of us came for my husband’s birthday dinner. Four of us planned to order lamb chops. They were out of them. Three ordered mashed potatoes. They were out of them. They ordered French fries instead and were given fingerling potatoes. The waiter apologized and then brought the French fries. I ordered the gnocchi after hearing no lamb chops were available. It appears they forgot about my order. After being reminded and offered apologies, the gnocchi finally arrived, after others had eaten half of their dinners. We were not offered a refill of water and had to ask for refills. Ketchup was not provided with half of the burgers and fries and had to be requested. We were very unhappy and will not return. We had such a great feast! We really enjoyed every bite and had enough to take home for lunch tomorrow. It was the perfect venue for my husband’s birthday. Meal was fine but lack of staple items on the newest menu left a lot to be desired. Great food and ambiance . Service is fantastic and quick. Good food, good service, nice ambience. What more could you ask for? We had a nice time at Citron and Rose Tavern. The ambiance is nice and the food is good if you have time to wait. The service was very slow and we had to wait a long time (it was not busy). Poor service. Expensive. Waiter did not know menu well.